Welcome to this Quick Start Guide! Here you will find instructions how to configure PDW to monitor paging networks using a 2 or 4 level interface. 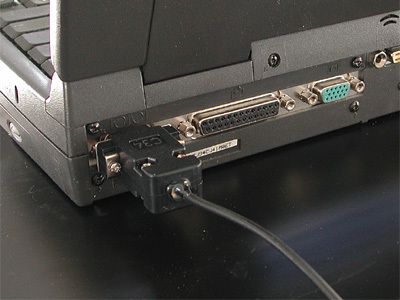 Connect the interface to your PC's serial port (COM port, RS232 port). It's a 9-pin connector. 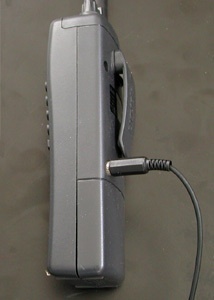 Connect the audio cable to your scanner's discriminator output. Tune your scanner to the frequency of the paging network you want to monitor. Be advised that your receiver should not be scanning, since it would miss paging transmissions (hence messages) while scanning other frequencies. Make sure you have downloaded the most recent version of PDW. Create a new folder on your PC, e.g. C:\PDW. Unzip all files and save them in the folder just created. 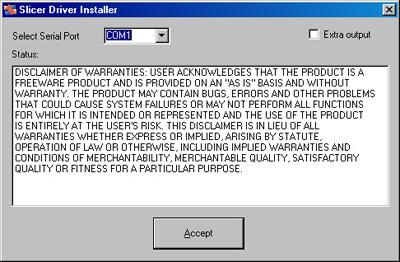 If you're using a PC with Windows XP or Windows 2000, you have to install the serial port driver 'slicer.sys'. This file is contained in 'xp_driver.zip'. Unzip the contents of this file and double click 'install.exe'. Choose the right COM-poort (usually, COM1) and click 'Accept'. You can disregard a possible warning from Windows XP about a lacking digital signature. After installation, you should restart your PC. Select the "START" menu, click "Run"
Enter "REGEDIT.EXE" and click "OK"
Search for the next registry key: "Hkey_Local_Machine\System\CurrentControlSet\Services\VxD\VCOMM"
Change the value of "EnablePowerManagement" from "01 00 00 00" in "00 00 00 00"
With this sequence, 'COM port power management' has been disabled. After your PC has restarted, open the map created earlier. Double click the green PDW icon and the screen left will appear. In most cases, PDW will work right away. If you didn't make any changes, PDW is installed for a 2 level interface on COM1. If your interface is connected to a different serial port, you can configure PDW by choosing 'Interface|Setup'. 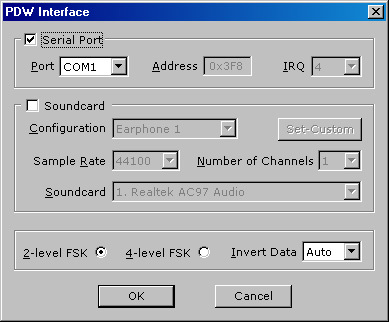 Make sure that the setting '2-level FSK' or '4-level FSK' corresponds to the interface you're using. Select 'Auto' for 'Invert Data'. Now choose 'Options|Program' from the menu. 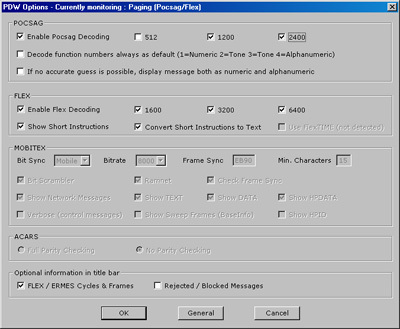 To receive FLEX networks, 'Enable Flex Decoding' and the boxes 1600, 3200 and 6400 should be checked. 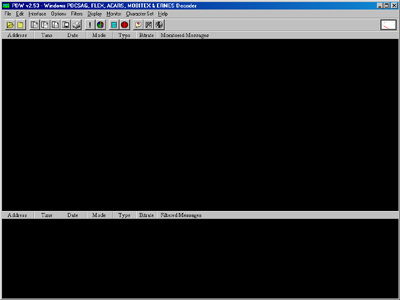 For monitoring POCSAG networks, 'Enable Pocsag Decoding' and the boxes 512, 1200 and 2400 should be checked. PDW has been configured for use. The needle of the meter should move a little when no signal being received, and show full deflection when a paging signal is received. Happy monitoring!